Young Justice Wanna be in a fanfiction? -and something completely random that we may or may not use. ex. secret fear, random facts, make it really random and weird. 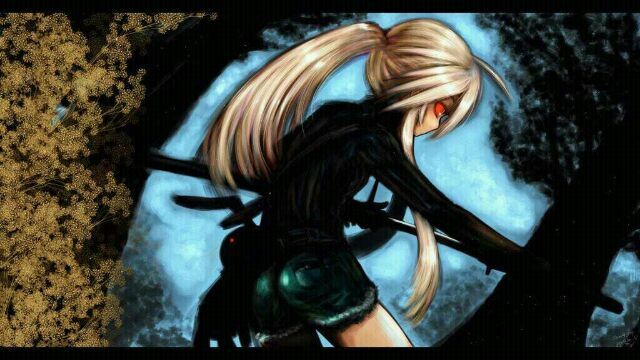 Appearance: Long Blonde hair, eyes change colors according to mood, always carries her butterfly and combat knife. Civvies: Mostly tanktops and whatever bottoms, with combat boots! Personality: Immature, teasing, hates showing emotion, has a very short temper and loves challenges, likes to be a lone wolf, uh.. she loves beating the piss outta people, and hates talking about her past. LOVES GUNS! Thanks so much! Oh by the way, if anyone sees Fang, tell him we kind of uh...volunteered him already. Yeah. Hopefully that's alright with him. So three spots left! Okay great! One spot left now! Delta: would you say she's similar in personality to Robin? Perfect! This is now officially closed! If you end up needing any more for a second or another reason. Apperance: Indian skin toned, Long(nearly to the floor) Jet Black Hair, Black Eyes, 4ft tall, when strong feeleings come(anger, saddness, love, anoyence) tail comes. Powers: contrrol over ice, fairly mild teliconisis, 58% cat DNA. Costume: Black Off sholder Bell sleave shirt with black laether(soft) vest over it. bell bottom tight black pants with nearly knee high lace up boots, hair out and a mask that cames up to a headband. elbow langth black gloves with claws that come out of the finger ends. Civil clothes: black boots(even in summer) black shirts with waist coats over. bell bottom jeans(black) glasses black framed. Personality: Slightly insecure(especialy around robin) witty in the mouth pretty good at come backs, loves the color black, loves music, plays piano, loves fun things and water. Personal: lost parents has a brother but went missing, adopted, real mom is sister of cat woman, cousin is zatanna, protege of black canary, taken in and tought by bat, found at school by robin(didnt know how to control the ice and froze him to the ground), very sad a lot and pretty close to artimis, and always getting in trouble with the bat for poking wally with unsheathed claws.